In the online movie "Miniverse," the solar system is shrunk down to the size of the continental United States. 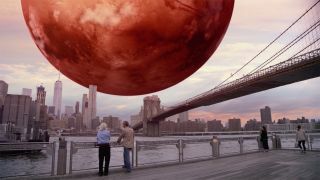 Here, Mars hovers over New York City. Retired astronaut Chris Hadfield is taking a road trip across the United States — and a journey through the solar system — in a new online movie set to be released in April. The solar system is big. Really, really big. To help people better grasp the scale of the Earth's planetary neighborhood, the new movie "Miniverse" scales down the solar system to the size of the continental United States. In the online movie "Miniverse," former astronaut Chris Hadfield and astronomer Laura Danly look at Pluto looming over a California pier. To explore this minisystem, Hadfield, who is perhaps best known for his rendition of David Bowie's "Space Oddity" aboard the International Space Station, takes a road trip from the East Coast to the West Coast — or, on the solar system scale, the sun all the way out to Pluto (a total average distance of about 3.7 billion miles, or 5.9 billion kilometers). He uses the road trip to teach viewers about the truly enormous size of the solar system, as well as what it would be like to actually visit the planets. Periodically, Hadfield is joined by a few passengers: Michio Kaku, a theoretical physicist and New York Times best-selling author; Derrick Pitts, chief astronomer and director of the Fels Planetarium at The Franklin Institute in Philadelphia; and Laura Danly, an astronomer and the curator at Griffith Observatory in Los Angeles. Whenever Hadfield and his guests arrive at the location of another planet, a giant image of that planet is superimposed on the screen, so the massive globes look as if they were hovering in the sky just above Earth. Mars hangs in the sky over New York City; Jupiter hovers above Washington, D.C., and Pluto is visible from a pier on the California coast. This visual trick further illustrates the size of the planets and the distances between them. "Miniverse" will be available to subscribers on CuriosityStream, an online video provider, beginning April 20. Subscriptions start at $2.99 per month, and new users can receive one month free.